Despite the influx of money, work can’t begin on the project until ongoing work by the Canadian Environmental Assessment Agency and consultations with First Nations are satisfactorily completed. The Springbank Off-Stream Reservoir project got a $168-million boost from the federal government on Wednesday. The money will come from the Disaster Mitigation and Adaptation Fund. 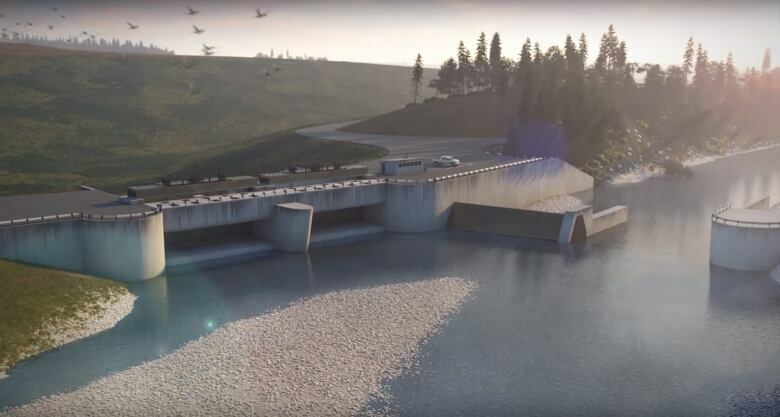 The project is slated to be built in Rocky View County to divert extreme flood flow from the Elbow River into a reservoir where the water would be contained until the flood peak passes, rather than inundating the Glenmore Reservoir in Calgary. In January, the provincial government announced it had acquired 188 hectares of land needed to build the reservoir. According to the province, it now has 20 per cent of the land it needs for the project west of Calgary. The $432-million reservoir would require about 3,870 acres (1,566 hectares) of land. The province has said it hopes to acquire the needed space through negotiations with landowners, but, if necessary, will expropriate land for the project so it can be partially complete by 2021 and fully complete by the end of 2022. The project has been met with opposition from some landowners in the area, including members of the Tsuut'ina First Nation. Opponents want the province to consider a dam in McLean Creek, but that proposal has already been rejected. Despite the influx of money, work can't begin on the project until ongoing work by the Canadian Environmental Assessment Agency and consultations with First Nations are satisfactorily completed. Alberta Transportation Minister Brian Mason said he is confident the work will be done. "Will we be able to get the regulatory bodies to approve this project? I believe we will," he said. "Will we be able to satisfy the Tsuut'ina concerns? I believe we will." Asked about the project on Wednesday, UCP Leader Jason Kenney said his party is "absolutely committed to getting flood mitigation infrastructure built as soon as possible" and said NDP efforts over the last four years have been a "complete failure." "They've been in office for nearly four years and we don't have a shovel in the ground. A flood could come next year, the year after this year, and the NDP hasn't moved an inch of soil," he said.